LOS ANGELES (CN) – Authorities on Wednesday found a body inside a destroyed home in Los Angeles County, the third death resulting from the Woolsey Fire which has destroyed over 480 buildings and homes in Southern California. Investigators found the body at a home in Agoura Hills. The body was burned beyond recognition authorities are unsure if the person found is the resident of the home. As of Wednesday morning, the Woolsey Fire had burned 97,620 acres across Ventura and Los Angeles counties. Firefighters have made steady progress and containment of the fire stands at 47 percent, but 57,000 structures are still in danger. Over 480 homes and buildings have been confirmed destroyed, but that number could rise as officials survey the damage. Fire officials will host town halls to inform residents about debris removal, rental assistance for those who lost their homes and the first rain of the season, which could present the danger of mudslides. The Woolsey Fire began Nov. 8 and has swept through multiple communities including Malibu, Westlake Village and Thousand Oaks, which saw the blaze a day after a deadly shooting in which 12 people were killed at a bar and grill there. Some residents forced to flee from their homes last week were given the go-ahead to return on Tuesday. But strong winds fanned a flare-up in the Santa Monica Mountains, darkening the skies and prompting road closures for the Hidden Hills neighborhood. Cal Fire said 83 percent of the park space in the Santa Monica Mountains Recreation Area, home to hundreds of animal species and plant life, has burned. Also destroyed was the historic Morrison Ranch House, a local mountain landmark where western movies were filmed, according to the Los Angeles Daily News. Last week, two as yet unidentified adults were killed when their car was overtaken by flames. Authorities believe the driver became confused in the smoke. Wednesday’s news comes one day after fire officials in Northern California reported 56 people have died from the Camp Fire, which all but destroyed the town of Paradise and has burned 135,000 acres in Butte County since it first started Nov. 8. Eight additional bodies were discovered Wednesday. The Butte County Sheriff’s Office said more than one hundred others remain missing, many senior citizens. The blaze is 35 percent contained. State officials including Governor Jerry Brown as well as members of the Trump administration toured what is left of Paradise on Wednesday morning. U.S. Interior Secretary Ryan Zinke, Federal Emergency Management Administration chief Brock Long and other officials joined Brown on his tour. Zinke’s comment comes less than a week after President Donald Trump blamed poor forest management for the California wildfires. But on Wednesday, Trump tweeted his support for Brown and the Golden State. The Camp Fire has already resulted in a lawsuit: On Tuesday, a group of Paradise residents blamed the utility giant Pacific Gas & Electric for sparking the Camp Fire with faulty equipment, according to their lawsuit filed in San Francisco Superior Court. Last week, PG&E sent a report to the state’s Public Utilities Commission stating a power outage had occurred Nov. 8 at 6:15 a.m. near where the Camp Fire is believed to have started. 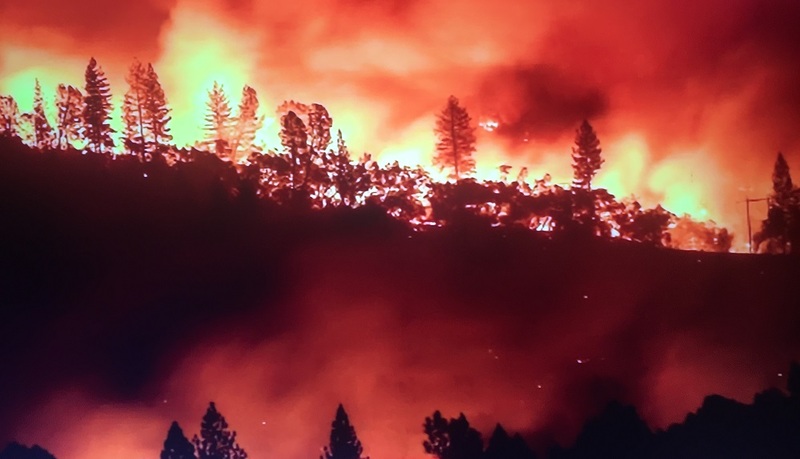 Cal Fire reported the Camp Fire started at 6:33 a.m. The Associated Press reports a landowner in the area was told by utility crews that wires on their property were sparking. The cause of the fire remains under investigation and Cal Fire will likely not know what sparked the blaze until after it is put out. PG&E’s shares have nosedived since its report to the state, and talk of bankruptcy has surfaced as the utility already faces potential liabilities from the 2017 wildfires, reports Market Watch.